Youth in New York City will join hundreds of thousands of youth across the world in leading the eighth annual 4-H National Youth Science Day (4-H NYSD) experiment. This year’s experiment, called “Motion Commotion,” will combine a speeding car collision and a distracted driving demonstration in a simulated activity that investigates the physical and human factors of motion. This 4-H National Youth Science Day experiment combines cars, calculators and cell phones to show how physics principles influence a pressing problem among U.S. teens. 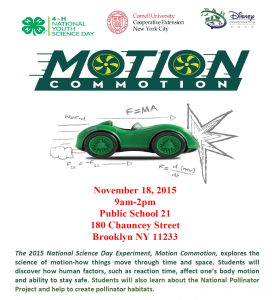 New York City youth will conduct the two-part “Motion Commotion” experiment on Nov. 18, 2015 at P.S. 21 in Brooklyn where they will use every day materials – including a toy car, modeling clay, ruler, calculator and cell phone – to explore physics in the real-world. In the first phase, youth will construct a simulated runway to analyze the speed, momentum and kinetic energy of a car in motion, and will explore the science behind the car’s collisions. In the second phase, they will lead an experiment that uses the same physics principles to demonstrate the consequences of distracted driving. 4-H NYSD is the world’s largest, youth-led science experiment. The national rallying event for 4-H Science, 4-H NYSD is an interactive learning experience that gets youth excited about science, technology, engineering and mathematics – or STEM, and spotlights the many ways New York City youth are engaging in 4-H Science programs year-round. The 2015 activity was designed by Oregon State University Cooperative Extension in partnership with Vernier Software & Technology and selected as the winning experiment for the eighth annual 4-H NYSD. In addition to youth in New York City, youth will conduct the “Motion Commotion” experiment at hundreds of local events taking place nationwide. The national sponsors of 2015 4-H NYSD are HughesNet, Lockheed Martin and U.S. Cellular. A recent longitudinal study conducted by Tufts University, The Positive Development of Youth: Comprehensive Findings from the 4-H Study of Positive Youth Development, revealed 4-H programming does indeed get young people more connected to science. According to the study, 4-Hers are two times more likely to participate in science, engineering and computer technology programs during out-of-school time (Grades 10-12) and 4-H girls are two times more likely (Grade 10) and nearly three times more likely (Grade 12) to take part in science programs compared to girls in other out-of-school time activities. Every year, youth complete more than five million 4-H science projects in robotics, agricultural science, rocketry, wind power, environmental science and alternative energy. Learn more about 4-H NYSD here. About: As the youth development program of the Cooperative Extension System of land-grant universities, 4-H is the nation’s largest youth development organization, which grows confident young people who are empowered for life today and prepared for careers tomorrow. 4-H programs empower nearly six million young people across the U.S. through experiences that develop critical life skills. The impact of the Cooperative Extension partnership is profound, bringing together the National Institute of Food and Agriculture of USDA, land-grant universities across the nation and county governments to resource learning opportunities for youth. In the state of New York, through Cornell University and the Cooperative Extension system, 4-H reaches every corner of the state —from urban neighborhoods and suburban schoolyards to rural farming communities. This entry was posted in NEWS and tagged 4-H, Cornell Cooperative Extension, CUCE-NYC, education, engineering, math, mentoring, National Youth Science Day, New York City, positive youth development, science, STEM, youth development. Bookmark the permalink.